Use this .pdf if you would like a printed version of the Handbook. Please note the print version is current as of August 2018. It will not be updated in the future. The website version of the Mentoring Handbook below is the official document for the ASFPM Mentoring Program. Website Handbook last updated August 2018. Our nation's approach to floodplain management relies on participation at each level of government, and states are particularly well situated to provide the leadership to establish competent, long-lasting floodplain management programs. States serve to implement federal and state programs while providing critical technical assistance to communities. Some states have their own permitting and flood mapping programs, whereas others have higher mandatory standards for development activities and planning functions. Unfortunately, capacity and capability are sometimes fleeting. ASFPM has witnessed this ebb and flow over the past several decades. A state that is strong and capable today may not be as strong in the future as changes in states’ priorities, politics and budgets can have significant impacts. Continuity may not be maintained as long-tenured staff retire and are replaced by new staff. Additionally, workplaces are changing over time. There are three particularly relevant trends: A single employer is less likely to provide lifelong careers and job security; work is increasingly complex — workers need to know more, not only to perform their jobs, but also to work effectively with others on teams; and there is a need for continuous skill building, including technical and business strategy skills. All of these factors are relevant for investment in your future career. ASFPM has observed that people who enter into floodplain management tend to stay within the field. A mentoring-based approach to professional development is an excellent way to build a larger professional network, get hands-on training from experienced professionals, and build a sense of community within this crucial profession. The ASFPM Mentoring Program was built with these trends in mind and will be a valuable resource for state staff – whether new to the field, a tenured individual looking to build new skills, or someone with expertise who is willing to share their knowledge by mentoring others in the profession. 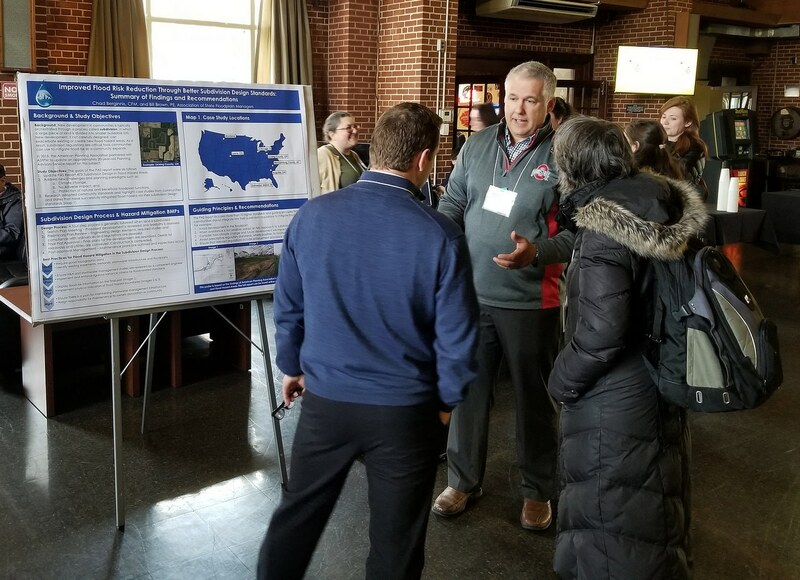 ASFPM Executive Director Chad Berginnis discussing subdivision design process and hazard mitigation recommendations at FEMA’s 2018 Hazard Mitigation Stakeholder Workshop held at the Emergency Management Institute in Emmitsburg, Maryland March 15, 2018. Photo by ASFPM's Flood Science Center Director Bill Brown.